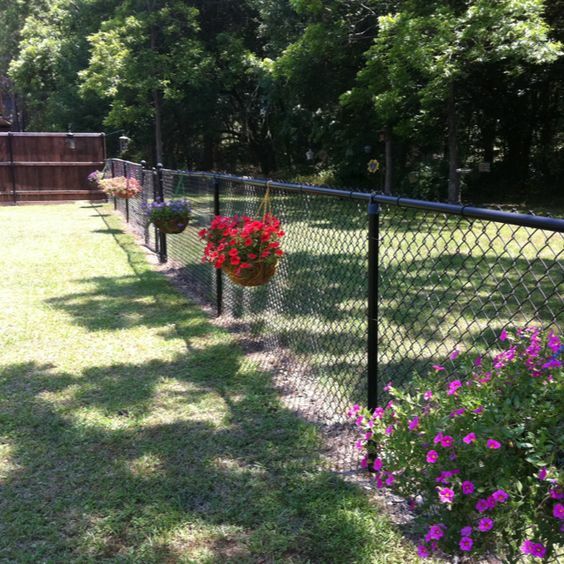 A beautiful yard deserves a beautiful fence. When building a brand-new fence isn’t realistic, there are updates you can make to your existing fence to take it from ugly to amazing. 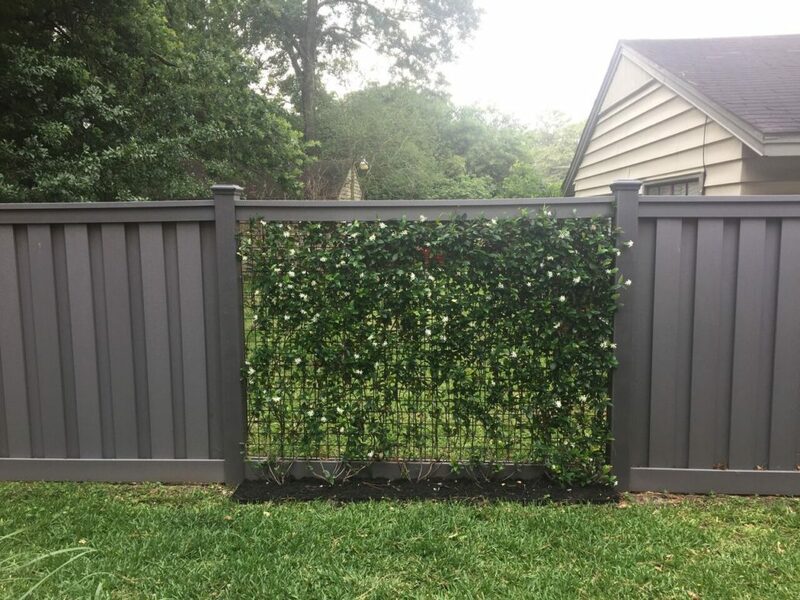 Planters and screens can hide the uglier parts of your fence, while a bit of paint or some solar lights can enhance the beauty of your yard. Most people consider their fences are a protective barrier, but they don’t have to feel like a cage. With a little imagination and work, your fence will become the perfect backdrop to your home and yard. A fresh coat of paint can do wonders for your fence. But you don’t have to limit yourself to one color! 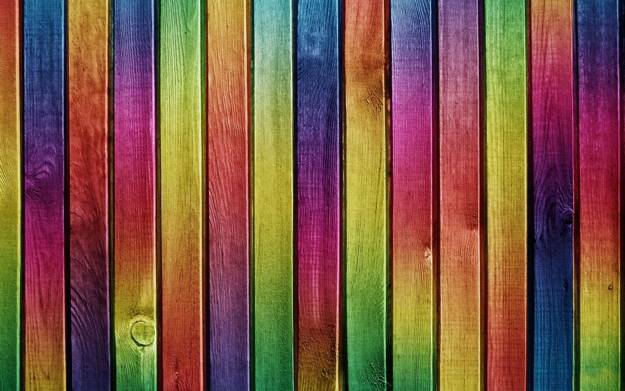 Paint sections in a rainbow of colors or try your hand at a fence mural. 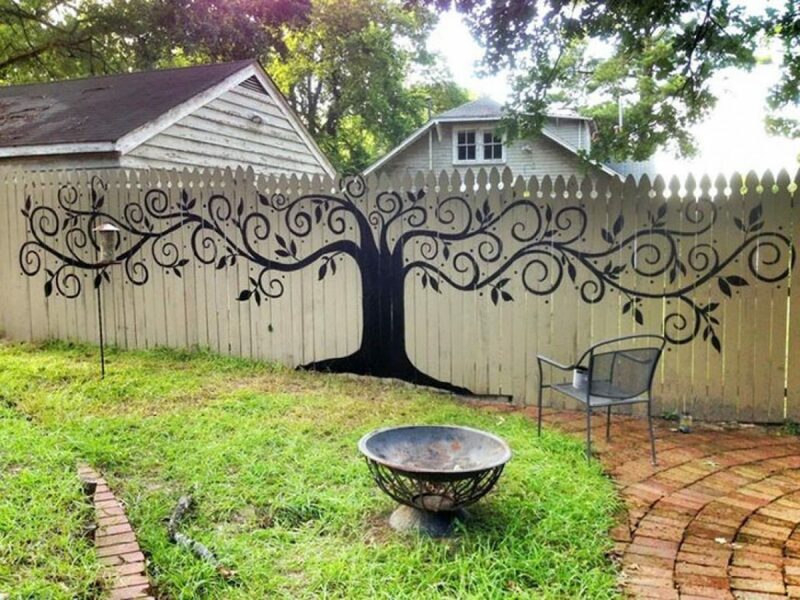 You don’t have to be an amazing artist to create some of these beautiful fences. 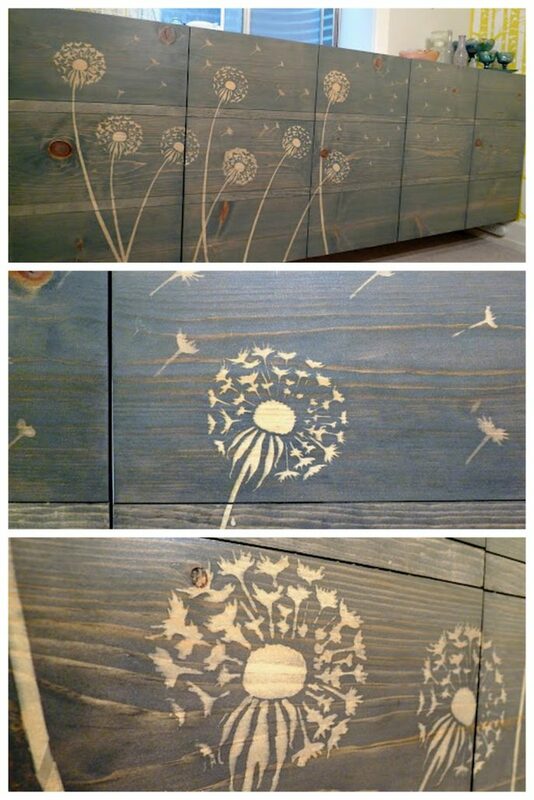 A stencil and a can of paint or stain is a simple way to create amazing designs. 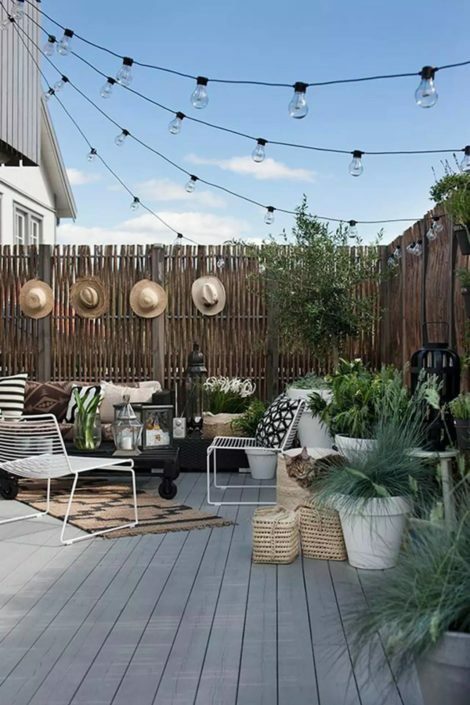 Floral and plant-based designs can add a more natural feel to your outdoor space. Some of the more whimsical designs can be fun for the kids playing in the yard. This simple dandelion fence design was made using a stencil and some wood stain. 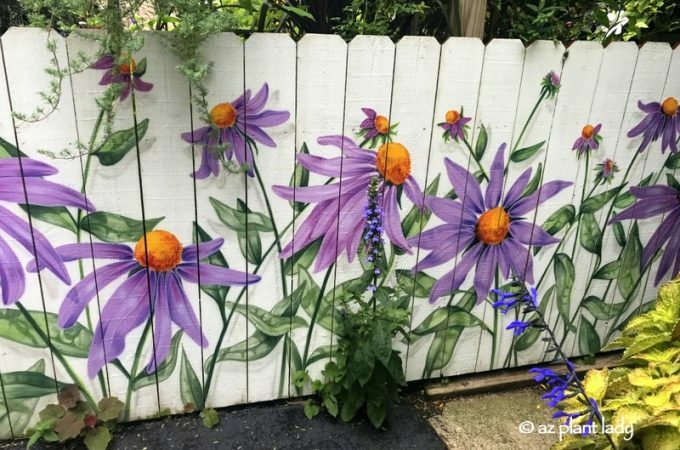 This larger-than-life floral garden has been painted on to the wood fence. 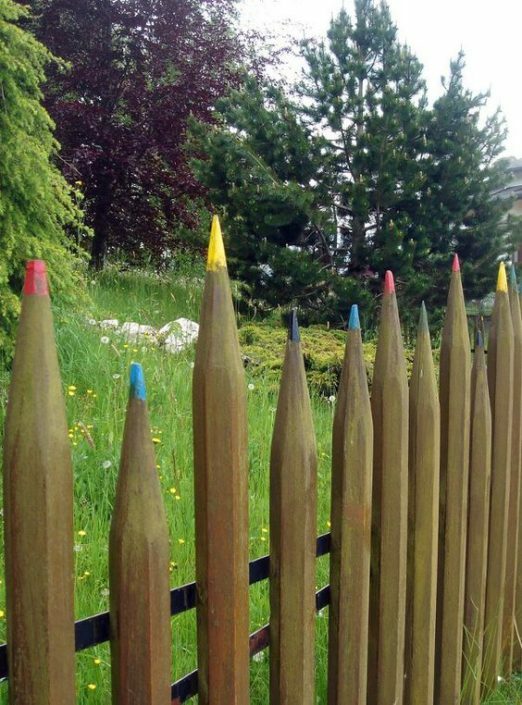 These fence pickets have been shaped and painted to resemble colored pencils. This would be especially fun for a fence around a play area. This intricately designed tree spans across the fence and doesn’t need any water. 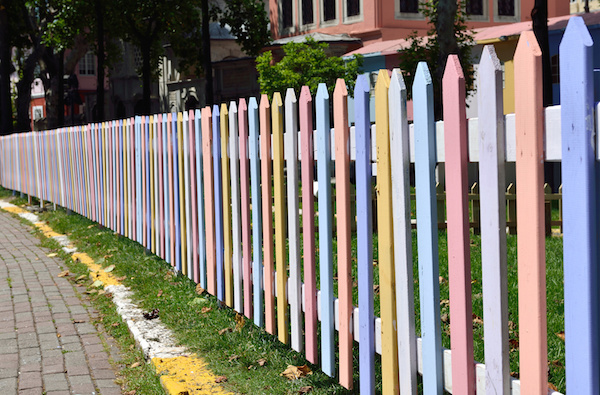 A rainbow fence is sure to match a colorful landscape. 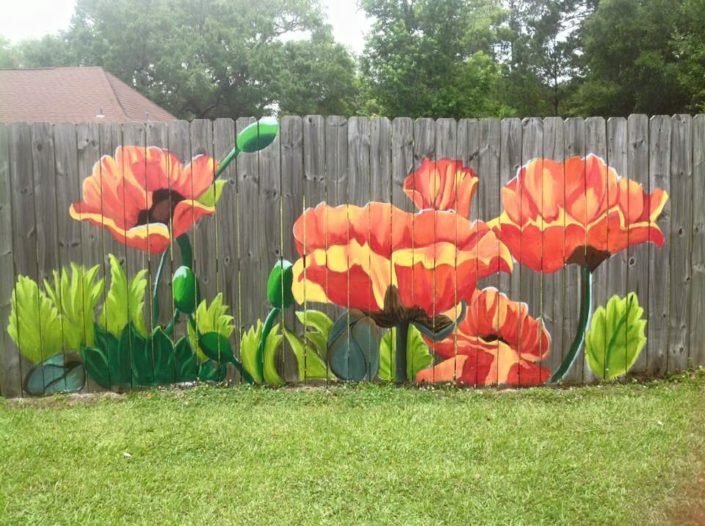 We love this colorful floral mural painted on a wood fence by artist Lori Anselmo Gomez. These pastel pickets could be the highlight of any yard. 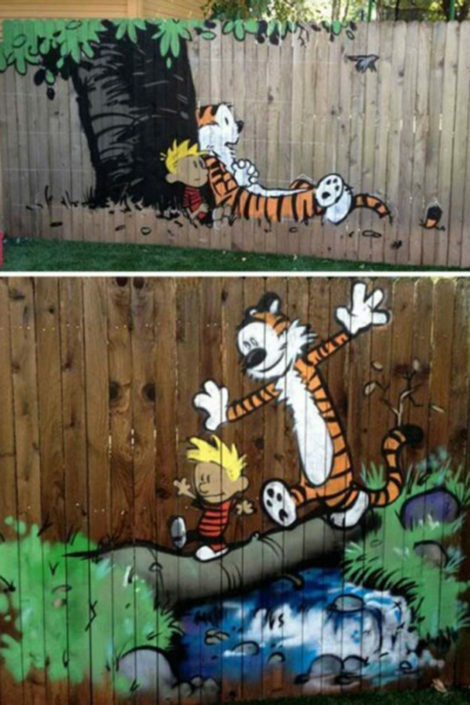 When you can’t paint a fence, consider a cover. This is often the best route when the ugly fence belongs to your neighbor and you can’t make changes to the actual fence. There are endless options to cover an unsightly fence. 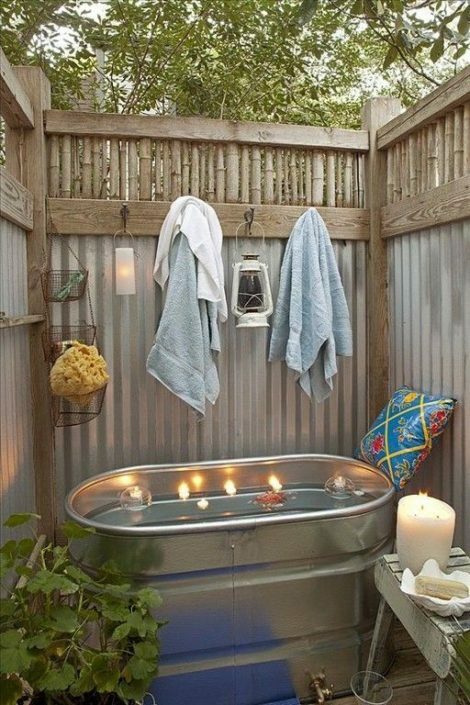 Consider bamboo screens or wood panels over a chain link fence. 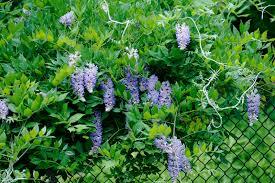 Climbing plants will go a long way to shield and cover an ugly fence and add more flora to your yard. Or take a different approach by weaving fabric through a chain link fence to create fun designs. A wood lattice screen is the perfect cover for a chain link fence. 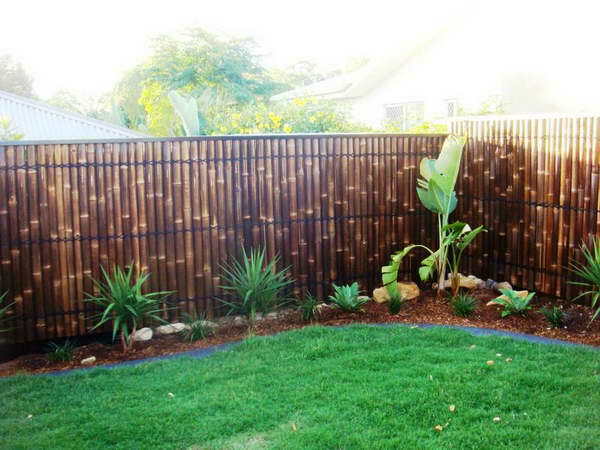 This dark bamboo wood is an easy solution to covering an ugly fence. A roll out bamboo screen is easy and eye-catching, in a good way. 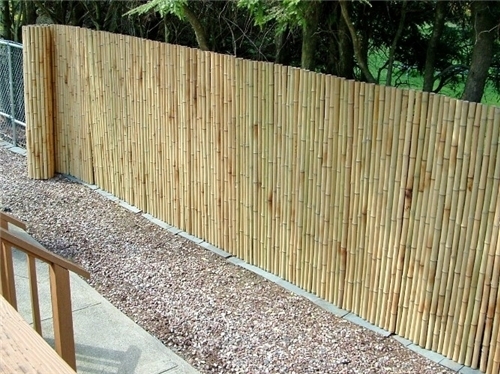 Attaching bamboo to a chain link fence is incredibly easy. 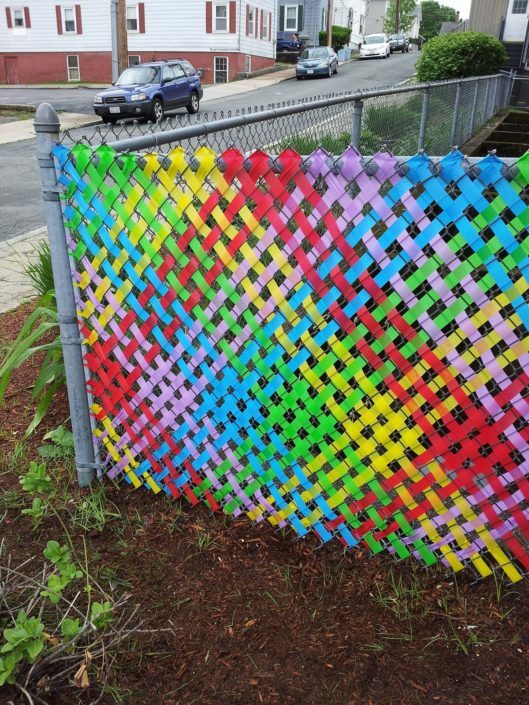 Embrace your chain link fence by weaving colorful fabric through it. 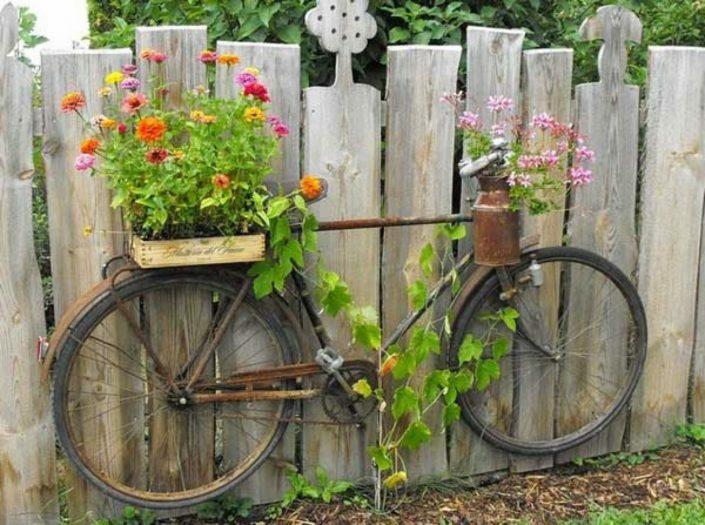 Make your fence a part of your landscape by covering it with flowering plants. Plants might take a little while to grow, but the effect can be stunning. 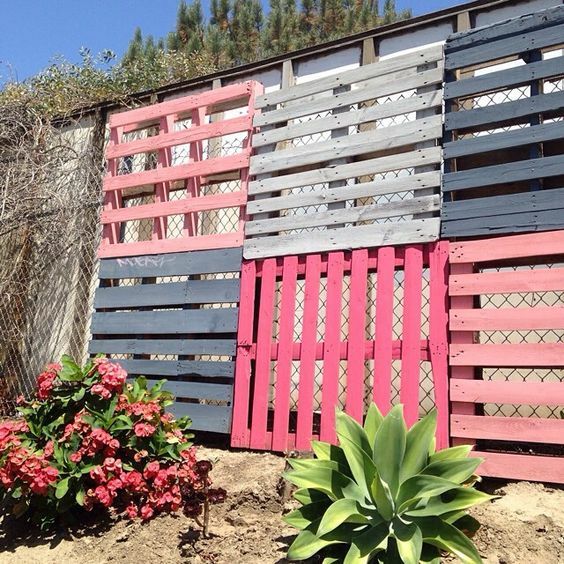 Hide a chain link fence with colorful wood pallets. Lights are a fun way to decorate your yard, while also allowing you to spend more time outside after the sun goes down. Solar lights and lanterns are the most cost-effective options for outdoor lighting. 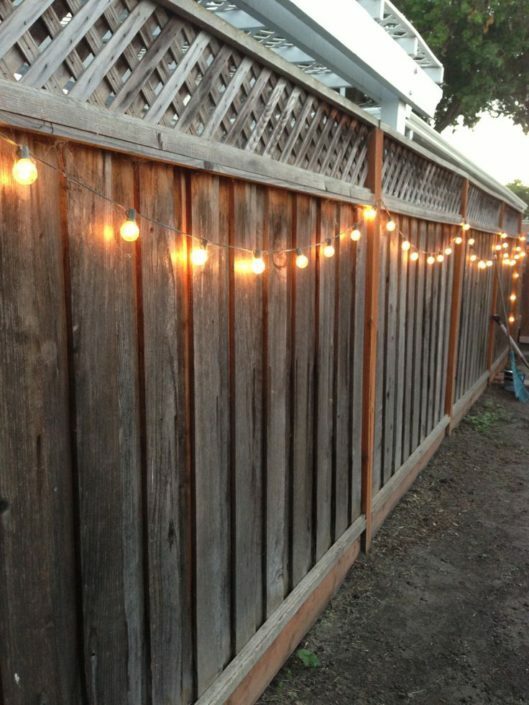 String lights (or Christmas lights) are easy to hang on your fence. Lights strung from the roof to the fence are perfect for a backyard party. For a more temporary decoration, hang glass jars with candles on your fence. All it takes is one string of outdoor lights to transform your fence. 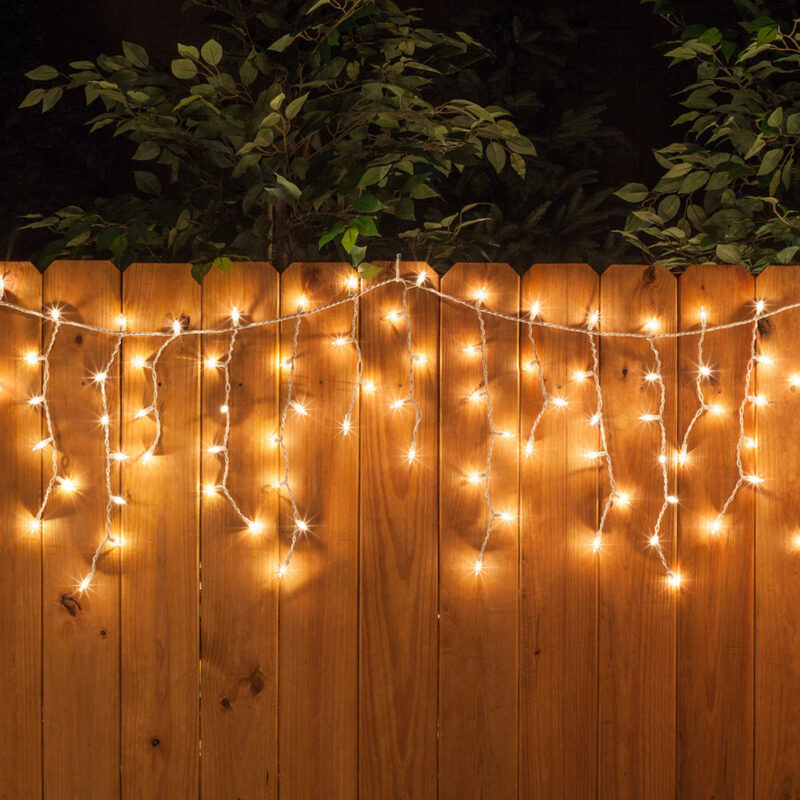 You can use Christmas lights all year long for a fence decoration. 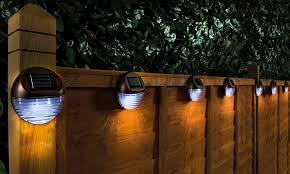 Solar lights hung along a fence look good both day and night. 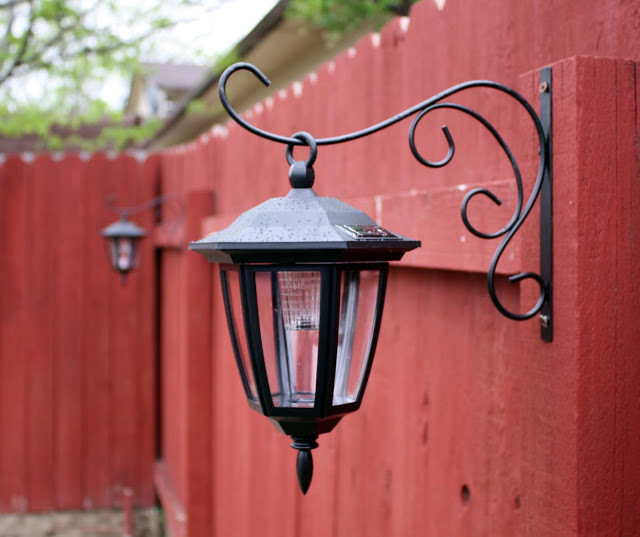 Attach solar lanterns to your fence posts for a functional decoration. These solar lights don’t require any wires. Planters along your fence will not only cover an ugly fence but allow you to expand your garden. Especially in small yards, when ground space is precious, a vertical garden can be a wonderful idea. 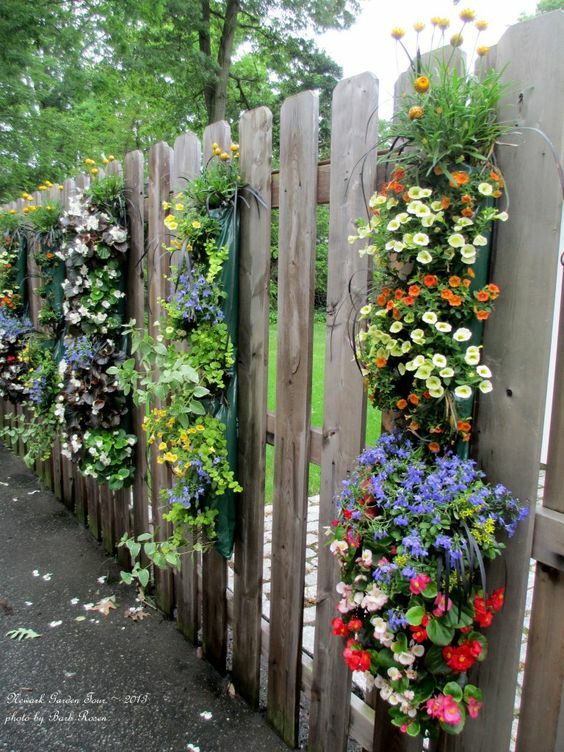 Hanging fence planters can be the perfect space for flowers, herbs, and even some fruits and veggies. 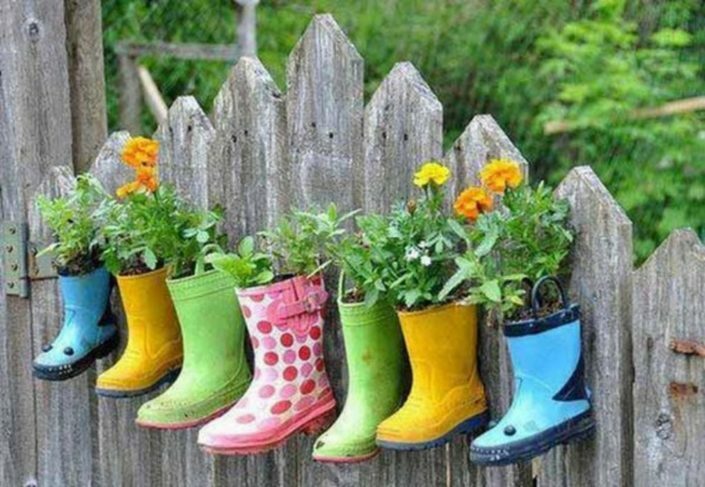 Try hanging old containers, rain gutters, and even colorful rainboots. Use old spoons to hang your planters. Old rain gutters hung on a fence make the perfect strawberry garden. 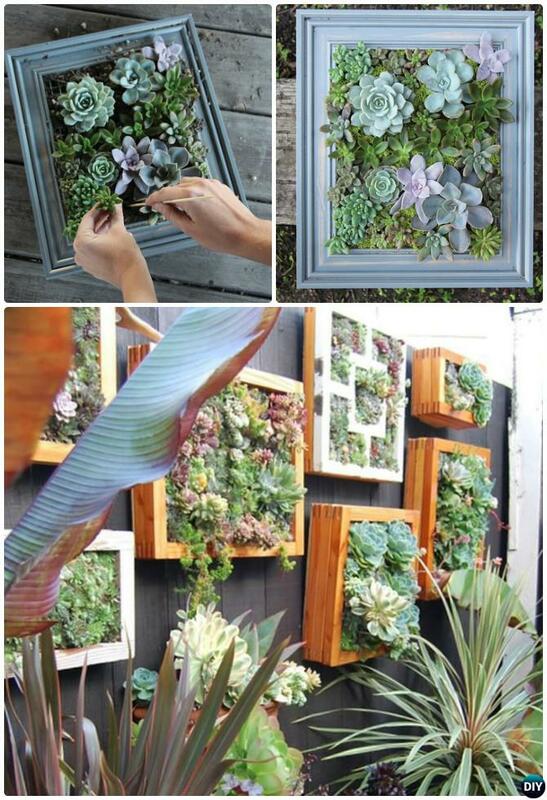 Use old picture frames for easy fence planters. 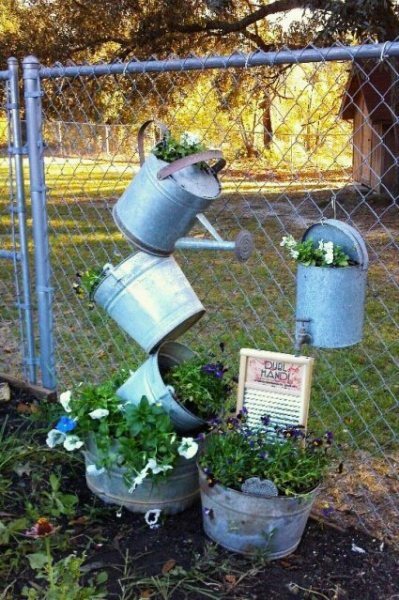 Use old watering cans to create a fun planter decoration. A vertical garden on your fence is perfect for smaller yards. Chain link fences are perfect for hanging planters. 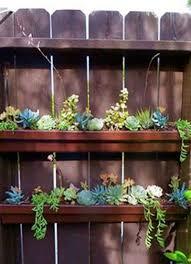 Hardy succulents will love these rain gutter planters. Old colorful rainboots look great as planters on a fence. An old bicycle can be a neat decoration, especially when used as a flower planter. 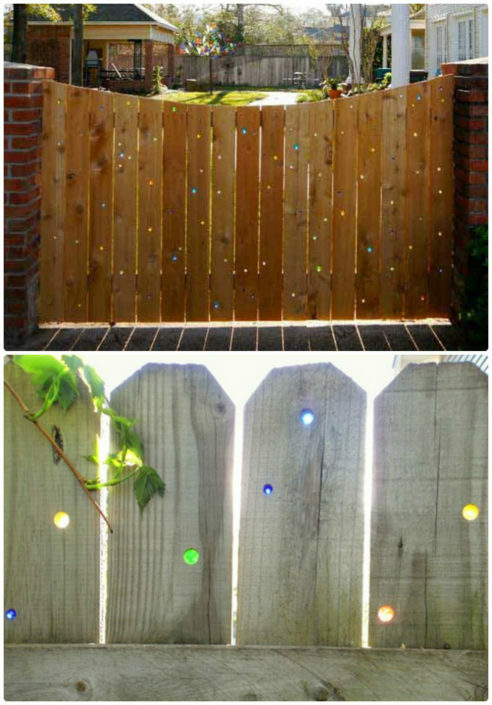 There are so many creative ways to dress up your fence. 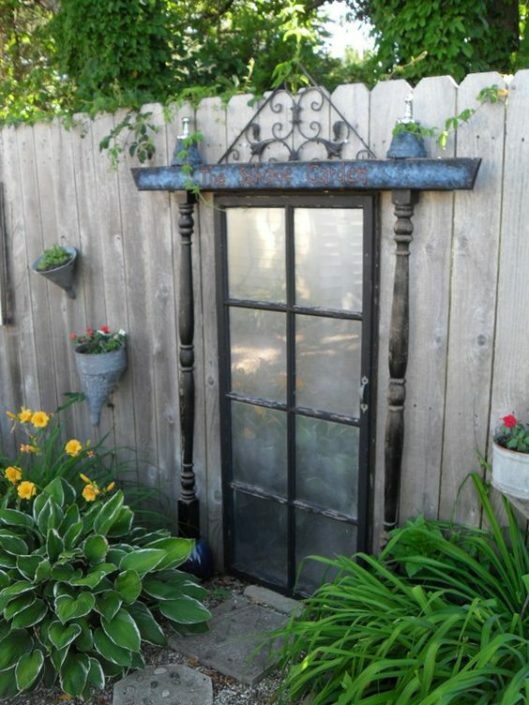 Adding old windows or door can give the illusion of a secret garden. 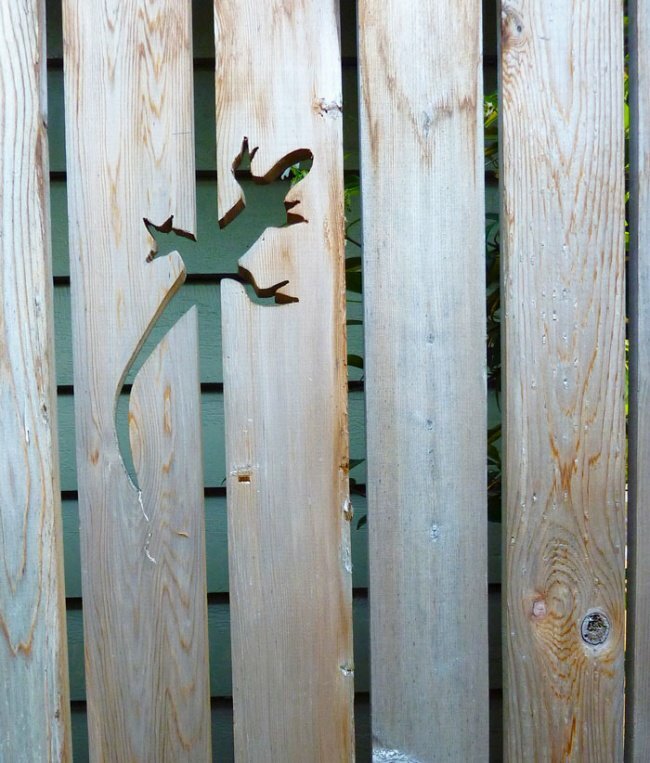 Upcycling scrap metal can be a great way to add a 3D design to your fence. Attract birds to your yard with birdhouses and feeders. 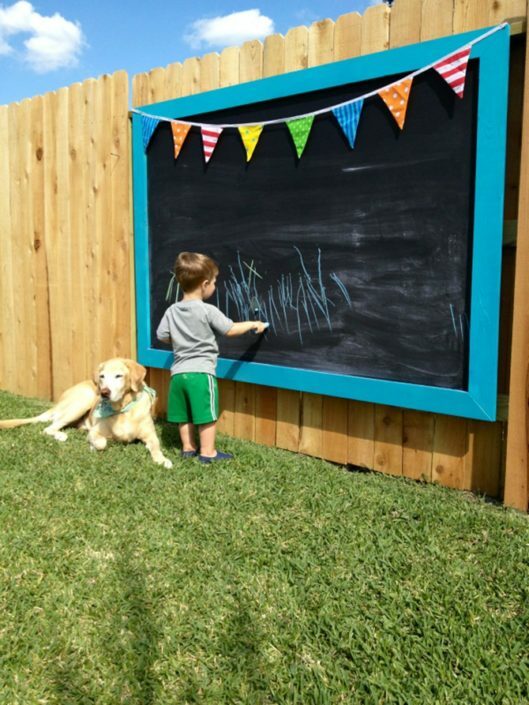 Add a chalkboard or simply paint your fence with chalkboard paint to give kids a giant drawing board. If you have the right tools, you can even make cut-outs in your fence. 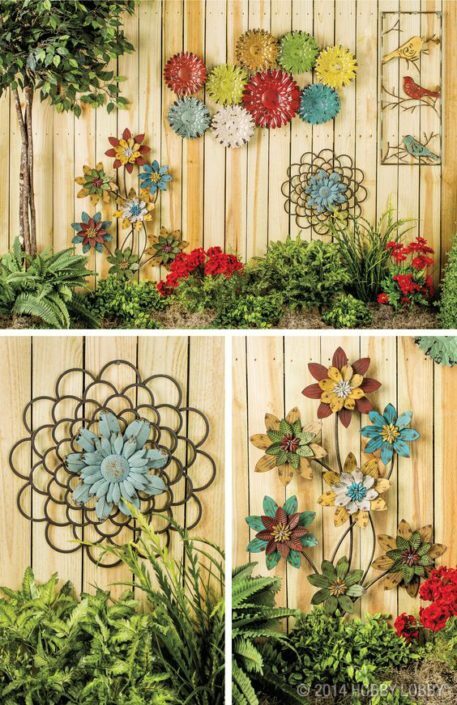 Recycled metal scraps can be transformed into giant fence flowers. 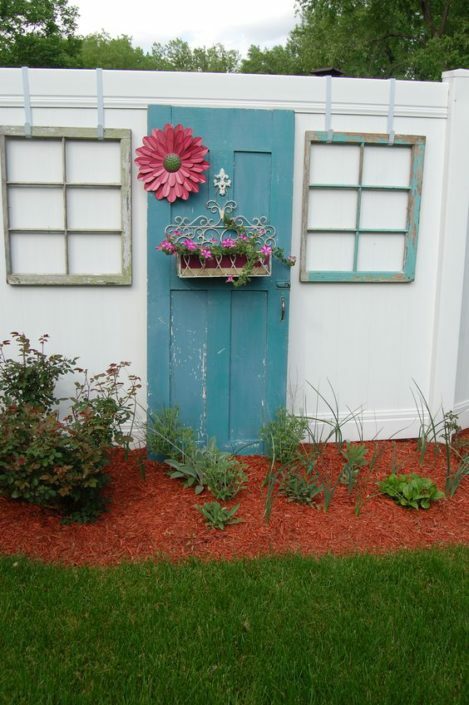 Adding an old door to your fence can give the illusion of a secret garden enterance. Placing marbles in the holes of your fence is a simple and beautiful decoration. Turn your fence into a giant sketchpad by adding a large chalkboard. Attract wildlife to your yard with these colorful bird houses. Use string art to display your favorite quote. 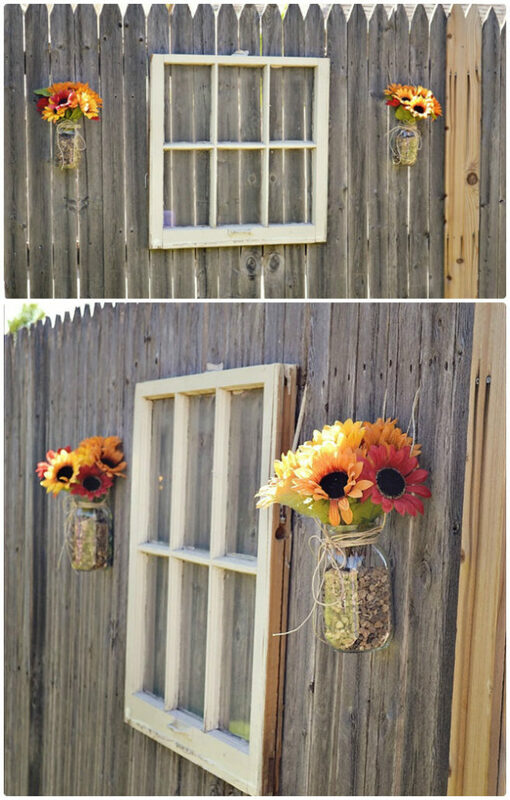 An old window and some fake flowers give this fence new life. Adding windows and a doors is a fun decoration that can cover an ugly fence. Even a small privacy fence looks good with some function decor. 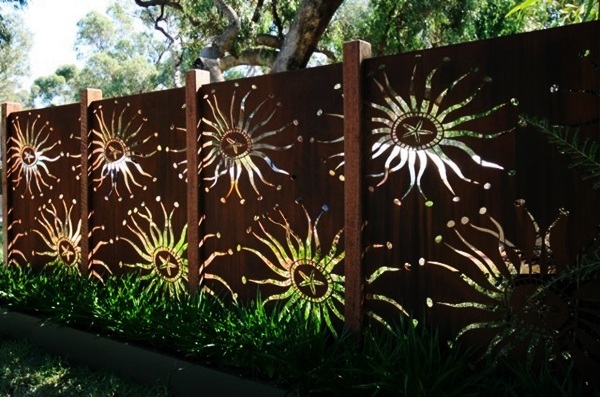 This sunburst cutout design allows light to shine through your fence. 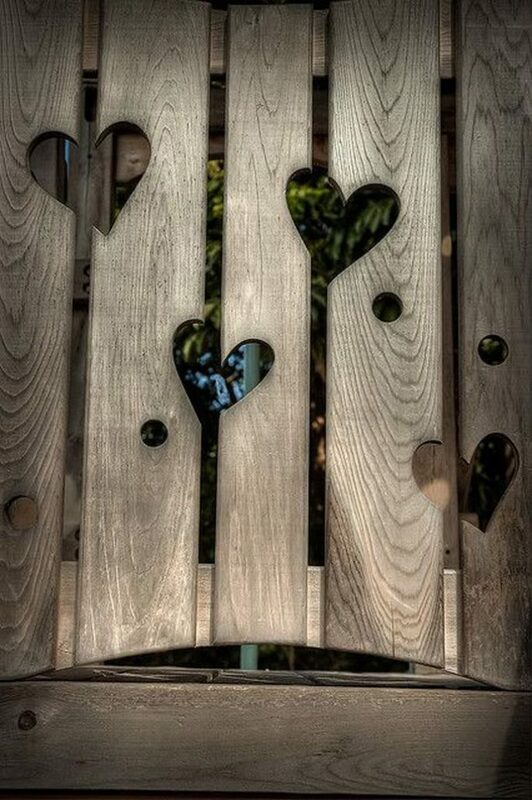 If you have the tools, cut out some fun designs in your fence. 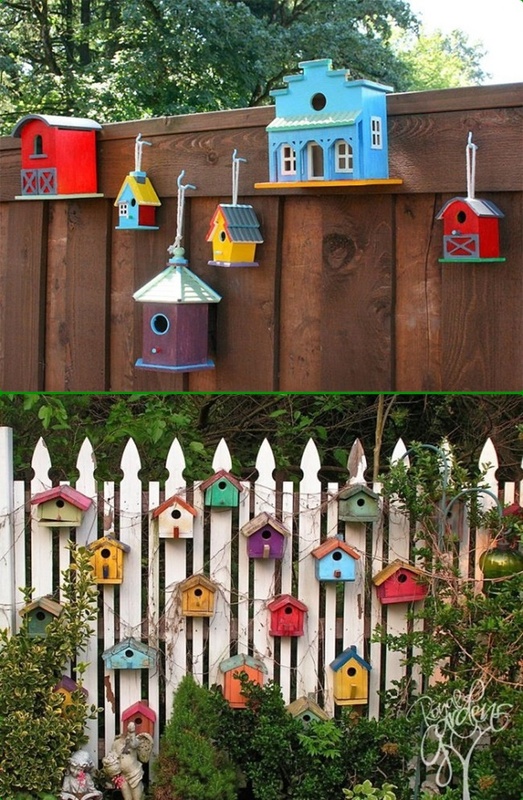 It doesn’t take much to add interest to your fence. 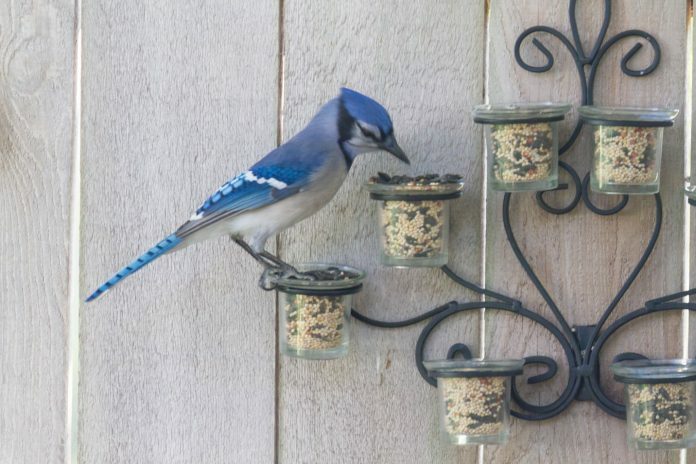 Add a pretty feeder to your fence to attract birds to your yard. Your fence should be a point of pride in your yard. 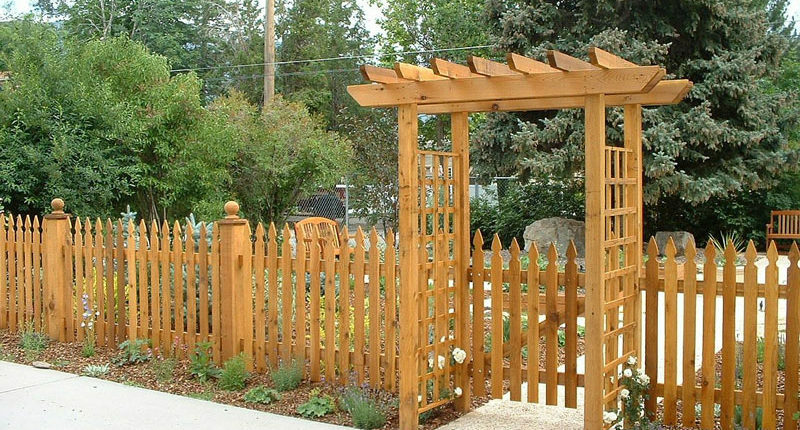 Don’t let an ugly fence detract from a beautiful landscape. Make sure that you actually own the fence before starting any complex alterations. If the fence is owned by a neighbor or an HOA, use the more temporary options to decorate the fence. There are endless possibilities, only limited by your creativity. Don’t have a fence to decorate? Or is your fence too ugly to fix? Contact us today to get a quote for materials. Our fences are so beautiful, you might want to leave them as is!